Using books to hide valuables is not a new idea but is one which has been utilised in homes throughout many centuries. 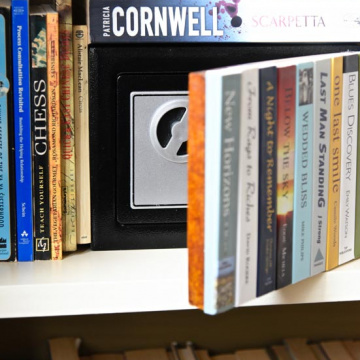 Our book safe is a firm favourite and so useful whether at home or away. One of our valued clients recounted the story that all the items within their book safe remained safely undiscovered when they had many other valuables stolen from their home. 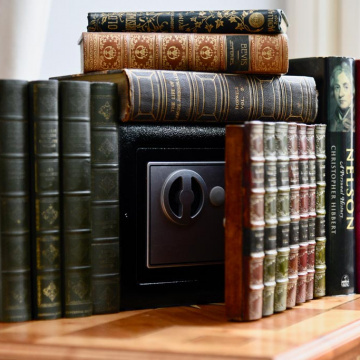 The recent additions of safes which can discreetly hide your valuables within an existing bookcase bring real peace of mind. 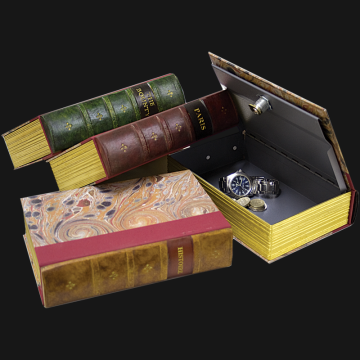 With spines hand painted, stained and gilded to resemble genuine antique books, these beautifully finished items provide secure discreet storage. 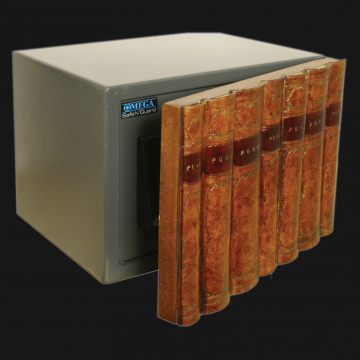 Hide away your valuables in one of our bookcase safes hidden amongst your other books. For smaller items, keep a single book safe close by you at your desk or overnight by your bedside. Height: 54mm / 2 1/8"
Width: 240mm / 9 7/16"
Depth: 155mm / 6 1/8"
A hide away for important items and easily tucked away amongst other books. This sturdy steel book safe discreetly conceals precious treasures. With the cover in our exclusive marble paper we have done all the work for you in terms of choosing a title Choose from three exciting titles The Bounty, Paris, Histoire or have a collection of the..
A hide away for important items and easily tucked away amongst other books. This sturdy steel book safe discreetly conceals precious treasures. With the cover in our exclusive marble paper we have done all the work for you in terms of choosing a title Choose from three exciting titles The Bounty, Paris, Histoire or have a collection of these..
A hide away for important items and easily tucked away amongst other books. This sturdy steel book safe discreetly conceals precious treasures. With the cover in our exclusive marble paper we have done all the work for you in terms of choosing a title Choose from three exciting titles The Bounty, Paris, Histoire or have a collection of these h..
Width: 230mm / 9 1/16"
This is a fabulous smart safe. Its insides are top quaity steel. It is insurance rated for £2,000 cash or £20,000 jewels. Strong steel construction with high security lock, 7 lever double bitted key lock and concealed hinges. Easy fitting bolts included. Key operated. It is all finished off with our lovely faux book fronting.This will slip into you.. Depth: 210mm / 8 1/4"
This is a fabulous smart safe. Its insides are top quality steel. It is insurance rated for £2,000 cash or £20,000 jewels. Strong steel construction with high security lock, 7 lever double bitted key lock and concealed hinges. Key operated. Easy fitting bolts included. 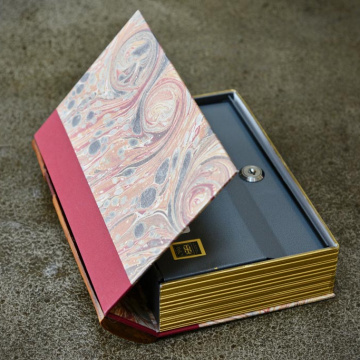 It has a faux paperback book front that will blend into your bookcase concealing.. Height: 260mm / 10 1/4"
Depth: 290mm / 11 7/16"
This high specification safe with amazingly effective concealment offers security to cater for the requirements of homes and businesses. It features modern digital keypad with override system, user programmable coding, predrilled holes for fixing and comes complete with master override keys and batteries. ..